At the invitation of the government of Venezuela, Special Envoy of President Xi Jinping and Minister of Agriculture and Rural Affairs Han Changfu will travel to Caracas to attend the inauguration ceremony of President Nicolás Maduro on January 10. At the invitation of State Councilor and Foreign Minister Wang Yi, Minister of Foreign Affairs and International Cooperation of the Republic of Sierra Leone Alie Kabba will pay an official visit to China from January 10 to 16. Q: Does DPRK Supreme Leader Kim Jong Un's visit to China have anything to do with the future US-DPRK leadings' meeting? Besides Beijing, will he visit other places? A: The Spokesperson for the International Department of the Central Committee of the CPC has released relevant information this morning on the visit of Chairman Kim Jong Un. Chairman Kim Jong Un is visiting China at the invitation of General Secretary of the Central Committee of the CPC and President Xi Jinping. China and the DPRK are close neighbors. It is an important part of our fine tradition to maintain high-level exchanges. As for the arrangements of Chairman Kim Jong Un's visit, we will release relevant information in due course. You asked whether his visit has anything to do with the second meeting between the DPRK and US leaders. China's position on the Korean Peninsula issue, including on contacts between the DPRK and the US, is known to all sides. China maintains that it is very useful for the DPRK and the US as key parties to the Korean Peninsula nuclear issue to maintain contacts. China supports the two sides in continuing with their dialogues and striving for positive outcomes. Q: We know that the US delegation is now having trade talks in Beijing with their Chinese counterparts. Will the visiting DPRK delegation get in touch with the US delegation? A: I am afraid that these two visits are two different things. Q: This is Chairman Kim Jong Un's first diplomatic activity of this year. Some believe that China may be factored in as a new variable in the Korean Peninsula situation for the rest of this year. What is your comment? A: What do you mean by saying that "China may be factored in as a new variable"? Which media were you quoting from? Journalist clarifies: Some US and ROK media commented that at present, the DPRK-US dialogue is the principal axis of the Korean Peninsula situation, but the addition of China as a new variable may affect future negotiations between the DPRK and the US. What is your comment? A: I haven't seen these comment as you just cited. Judging from the statements made by the ROK and the US side, they all have a positive attitude towards Chairman Kim Jong Un's current visit. You said that China will be a "variable" to the Korean Peninsula issue. I wonder if that translation is accurate or not. It is only fair to say that China has been an important force in promoting the political settlement of the Korean Peninsula nuclear issue and peace and stability on the Peninsula. We once held the Six-Party Talks, a process initiated by China to advance the settlement of the Korean Peninsula nuclear issue. This process remains to be one that has seen the most positive outcomes ever achieved. Going forward, China will continue to work with all relevant parties to jointly move forward this process. If China must be described as a factor in this whole process, then China is and will always be a positive factor. Q: You said it's an important tradition for China and the DPRK to maintain close exchanges. How do you explain that six years had passed with no meetings between Chinese leader and Kim Jong Un, and now within one year there have been four meetings? A: I just said that the two parties and two states of China and the DPRK enjoy traditional friendly ties. In fact, the two sides have been sustaining the tradition of maintaining contacts over different periods, and such contacts take place in various forms as the situation evolves. There is no need to read too much into that. 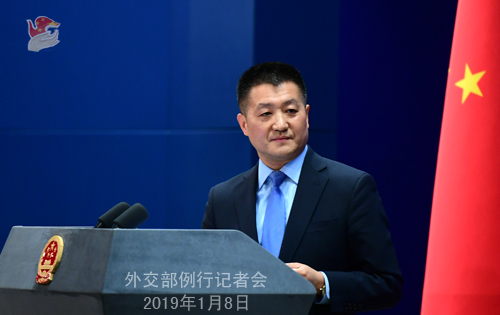 What merits more of our attention is that both China and the DPRK are committed to deepening bilateral relations, properly resolving the Korean Peninsula issue, and maintaining peace and stability of the Korean Peninsula and the whole region. Q: Today is the birthday of DPRK leader Kim Jong Un. Did China specially invite him to be in China for his birthday? Are there any new economic pledges that China plans to make to the DPRK during this visit? A: On your first question, it is very normal for the two parties and two states to maintain friendly exchanges. As for the specific arrangements and outcomes of the high-level meetings between the two sides as well as Chairman Kim Jong Un's visit, we will release relevant information timely when we have them. Q: Are there any plans for President Xi Jinping to make a return visit to the DPRK now that Chairman Kim Jong Un has visited China so many times now. Are there any plans coming up? A: China and the DPRK have the tradition of maintaining friendly high-level exchanges. High-level exchanges have been playing an important leading role in promoting the growth of bilateral ties. If we have relevant information, we will release it in a timely manner. Q: What are China's expectations for Chairman Kim Jong Un's visit to China? What outcomes do you expect to achieve? A: You may still remember that last year, when General Secretary and President Xi Jinping met with Chairman Kim Jong Un, the two sides agreed to maintain frequent contacts and communication in various forms. Both China and the DPRK believe that it is necessary to strengthen strategic communication and make concerted efforts to ensure the sound and steady development of bilateral ties, achieve the lasting peace and stability on the Korean Peninsula and promote peace, stability and prosperity of the region. There is no doubt that Chairman Kim Jong Un will have an in-depth exchange of views with the Chinese leadership on deepening relations between the two parties and two states as well as on international and regional issues of mutual interest. Regarding the concrete outcomes of this visit, we will issue relevant information in a timely manner. Q: What signal was being sent by Vice Premier Liu He's drop-in at the China-US trade talks yesterday? A: The China-US trade talks were scheduled for yesterday and today. We believe that the relevant information will be released after the talks. 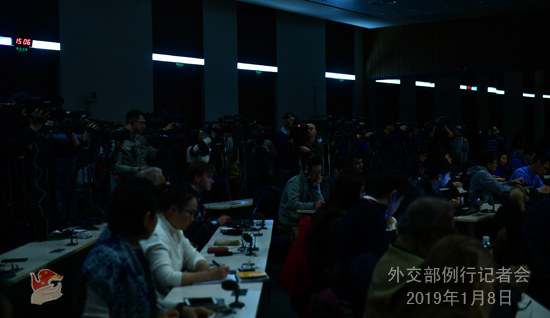 You can see from the media reports that yesterday Vice Premier Liu He attended the opening ceremony. I think it is only natural that Vice Premier Liu He, as the Chinese initiator of the China-US trade talks, wanted to see the representatives of the two sides. Q: Some reports say that Chairman Kim Jong Un's visit to China coincides with the China-US trade talks and China may use this visit as a bargaining chip in the trade negotiations. What is your comment? A: China's diplomacy incorporates rich and diverse contents and there are a lot of important items on our diplomatic agenda. So, there is nothing unusual that some diplomatic events coincide with each other. Regarding Chairman Kim Jong Un's visit to China and the China-US trade talks, China's position is very clear. Regarding Chairman Kim Jong Un's visit to China, we stay committed to developing friendly relations between the two parties and two states. This position is clear-cut and steadfast. China's position on resolving the China-US trade frictions is also open and transparent. On this issue, our attitude is sincere, and our resolve is firm. The US side is very clear about China's position in this regard. I don't think we need to resort to any maneuvers to get our message across to the US side. 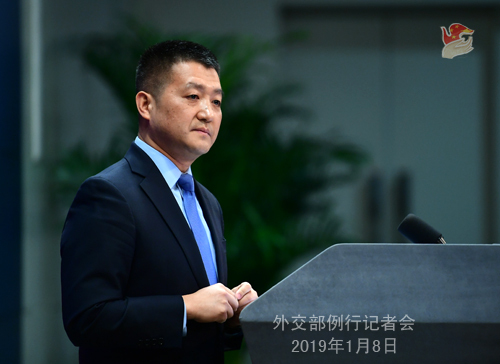 One year ago today, I announced here the opening of the official WeChat account of the Spokesperson's Office of the Ministry of Foreign Affairs. In a blink of an eye, our WeChat account is about to celebrate its first birthday. Over the past 12 months, we have updated more than 600 posts and gained the favor of nearly 150,000 followers. I would like to express my heartfelt gratitude to the media and fans for your support to our WeChat account. In order to repay you support and favor, the Spokesperson's Office has decided to organize a special activity. We have already posted an article to celebrate the first anniversary of the account. We welcome everyone to follow our account and leave a message under the post. You can talk about your expectations for the account or offer some ideas and suggestions. We will select a group of followers from those who have left messages for us under the article and then send a gift from the Spokesperson Office of the Ministry of Foreign Affairs. You are all welcome to participate in this activity.